In my previous article, I propose a design that allows for a more systemic and purposeful way of developing managers and leaders. The basic idea is to provide leadership opportunities (setting strategy) and management opportunities (executing the strategy) without conflating both. Under this model, the design is to identify people who are good at strategy, identify people who are good at strategy execution (management) and make sure that they are good at either strategy or strategy execution. The same individual can try out both paths – if that individual is considered some sort of amazing performer – but this design is intended to find lots of people who are good at leadership and management, not just that magical super-performer as the current designs seem to be skewered toward. 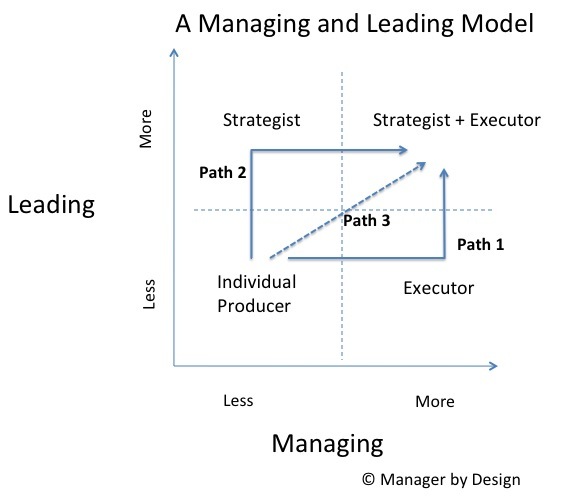 What I find interesting about this view is that, according to this model, the paths all conclude with the individual being both a strategist and a strategy executor. In short, the paths imply the person has two jobs: Coming up with the ideas and seeing the ideas through. These appear to be two entirely different skill sets, and skill sets that should be valued separately. There are certainly some people who can do both strategy and strategy execution well, but, really, how many? And do people who like to strategize also like to manage a team? Maybe sometimes, but not always. So it would be important to find out, wouldn’t it? Let’s say you have someone in your organization who is very good at strategy. That sounds like something that would be valuable to many organizations. How do you find out? Does that population come from the “Strategy Executor” group? Or would it come from the individual producer group? And once that strategist is identified, is it a full time job? Or do you make it one by transforming the strategist into a strategist + strategy executor? In the current management design, the most common action is to look for the strategists from the management group (strategy executor group) (path 1 or 2 above). Setting strategy is a part-time job, being shared with strategy executor. 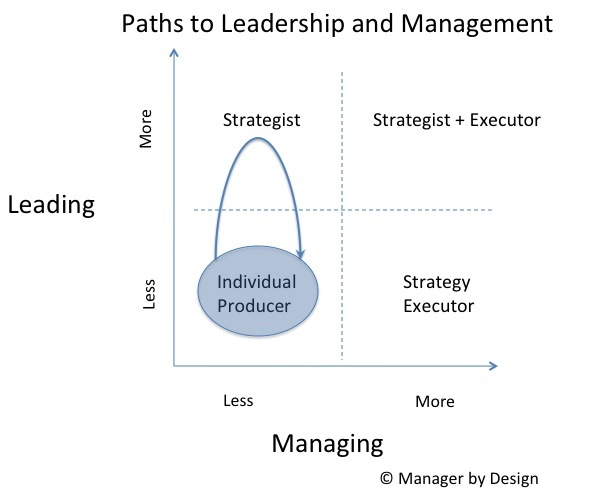 In looking at path 3, it assumes that strategy is a springboard to management, and that the skill of setting strategy isn’t “enough” of leadership, and requires immediately halving this role to include managing a team. So all of these “designs” appear to have inherent risks, which includes asking a leader to lead in a way that they aren’t good at, and asking a manager to become a leader/strategist. So what are alternate paths? Here are a few that would seem less risky to me, and allow people and organizations to see what they are good at. In this design, you have a means for people to hone their skills in what can be considered two different skill sets – strategy and strategy execution. In doing this, they can focus on the aspect of what they are being asked to do without the clutter of conflating leadership and management.